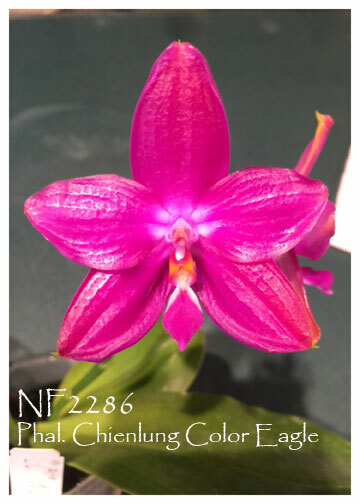 An exciting new hybrid from the famous and proven parent, Phal. Dragon Tree Eagle ‘Dragon Tree’ ! The pod parent, Phal. Chienlung Red King, is a hybrid of Phal. (Ld’s Bear King x pulchra) with Phal. Ld’s Bear King adding another shot of Dragon Tree Eagle to the cross. The addition of Phal. pulchra to this hybrid has nicely increased the shorter spike length of Dragon Tree Eagle in addition to adding even more fragrance and heavier substance to this population. Since this is a hybrid seedling population, the progeny from this cross will vary from solid reddish-purple flowers to even more intensely colored Dragon Tree Eagle-type flowers but on longer spikes. A great reason to flower more than one !